Music Minus One Soprano. By Zvetelina Maldjanska. 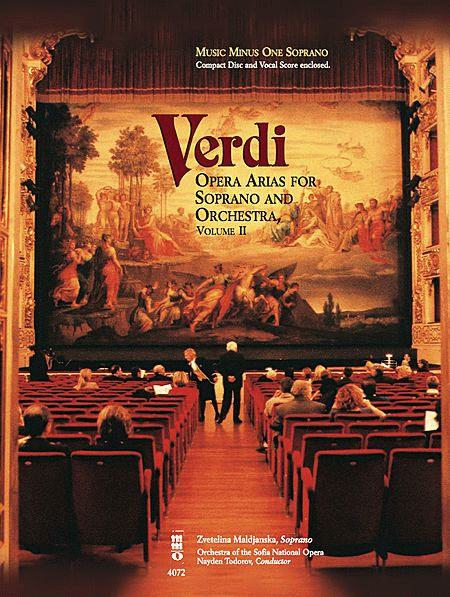 By Giuseppe Verdi (1813-1901). Sheet music with CD. Music Minus One. Opera. Softcover with CD. 32 pages. Music Minus One #MMO4072. Published by Music Minus One (HL.400568). These soprano classics from Verdi's most popular operas include selections from Rigoletto, Ernani, and more. Includes the magical 'Ave Maria' from 'Otello.' Beautiful music made even better as you perform it with the world-famous Sofia National Opera and conductor Nayden Todorov. Includes an expansive, newly engraved vocal score, printed on high-quality ivory paper; and a CD+G graphics-enabled compact disc with complete versions (with soloist) in digital stereo, followed by digital stereo orchestral accompaniments to each piece, minus the soloist.